Annual or perennial herbs, shrubs, lianas, twiners and creepers. Leaves alternate, entire, lobed, dissected or rarely palmately compound, exstipulate. Flowers in terminal or axillary simple or compound cymose inflorescences, bisexual, mostly actinomorphic. Sepals 5, free or rarely slightly connate basally. 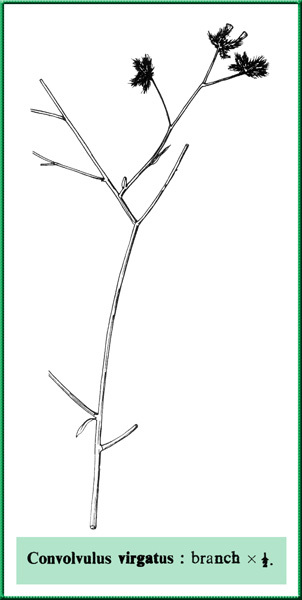 Corolla of 5 sympetalous lobes, infundibuliform, campanulate to salver-form. Stamens 5, epipetalous, free, included or exserted, the anthers 2-locular, mostly extrorse. Carpels 2, rarely 3 , ovary superior, usually upon an entire or lobed disc,l-2- or rarely 3-locular, ovules 2 per locule, style usually 1, occasionally bilobed or divided into 2, filiform, the stigmas usually 2, globose, ellipsoid or filiform. Fruits usually dry capsules or berries or dry baccate or indehiscent and chartaceous. A pantropical family with 40 or more genera and about 1200 species. Represented in Pakistan by 13 native and cultivated genera. Acknowledgements: We are grateful to the United States Department of Agri-culture for financing this research under P.L. 480 and to the Directors of the herbaria at the Royal Botanic Gardens Kew and Edinburgh for the loan of herbarium specimens. Thanks are also due to Messers B.L. Burtt, I.C. Hedge and Miss J. Lamond for going through the manuscript and to Dr. Verdcourt for the identification of Merremia palmata.